This collection of poems suggests that every moment holds wondrous possibilities. Vinay Benjamin’s poetry collection Subtle Moments celebrates the wonder of human existence by exploring its most mundane parts. Poems range in focus, from aging to loneliness and from the sweetness of poetry to the horrors of violence. This collection recognizes that although not every subtle moment is beautiful, humanity is. Subtle Moments is segmented into four subsections titled “Reflections,” “Nature,” “Memories,” and “Mirrored Verse.” Sections flow well with each other in their dedication to exploring the universal human experience. The focus on human nature is most clear in the “Nature” and “Mirrored Verse” sections, which tackle topics like spirituality, community, and art. “Reflection” and “Memories” more clearly draw from the poet’s own experiences. These poems flourish when they turn the personal into the universal, in recognition that one person’s experiences expand beyond them. Similarly, “Twilight Worshippers” is about a grassy clearing seen at twilight, but the image is transformed into a place of universal worship, just as an autumn wind is made into street art in “Strewn Graffiti.” The poems constantly offer a shift in perspective, a way to regard simplicity as extraordinary. As beautiful as the language of “Twilight Worshippers” is, the profusion of effusive imagery makes reading slow going. Elsewhere, poems contrast this style and read as much more personal, their language relaxed and casual. “Valentine,” a poem from the “Memories” section, recalls young love in simple and accessible language, refraining from including commentary on human nature and instead sweetly fixating on the memory of a first kiss. Poems like “Valentine” keep Subtle Moments from becoming too concentrated on the cosmic and universal. 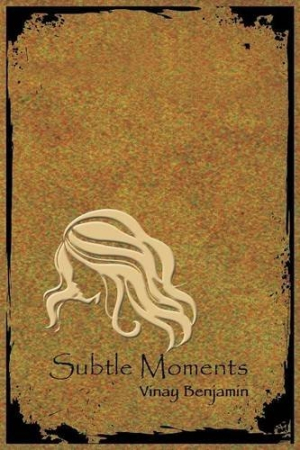 Subtle Moments is best read in sprints because of its tendency to veer into conceptual territory. The poems work best in clusters, in which they coagulate and form images greater than their individual parts. At their best, these poems are an impressionistic representation of the beauty of nature, the passion of writing, and the power of thought. However, poems sometimes blend together and lose their individuality. Subtle Moments both reveals one individual’s life and thoughts and offers commentary on the transcendence of the human experience. Its poems are worth sifting through and lingering on, offering frequent reminders that every moment may hold something wondrous.